There are several questions about the JFK assassination that are not dealt with in the main part of the text, in most cases because they are not relevant to the central issue of whether or not Lee Harvey Oswald was the lone assassin of President Kennedy. These questions seem to interest many people, and some of them are dealt with here. Newcomers to the assassination, or those who are confused by the enormous amount of evidence that has been generated, may benefit from a summary of the main questions in the JFK assassination. The Warren Commission claimed that Lee Harvey Oswald shot and killed Officer J.D. Tippit in Oak Cliff, Dallas, about 40 minutes after the assassination of President Kennedy. The question of Lee Harvey Oswald’s motive for killing President Kennedy remained unanswered by the Warren Commission. Three weeks before the assassination, the FBI warned of a plot to kill JFK in Chicago. A man named Thomas Arthur Vallee seems to have shared several characteristics with Lee Oswald. Did Lee Oswald Shoot at General Edwin Walker? The Warren Commission and the FBI claimed that Lee Harvey Oswald attempted to shoot General Edwin Walker in April 1963, an act that demonstrated the assassin’s capacity for violence. The convenient murder of Lee Harvey Oswald aroused suspicions that Jack Ruby had been involved in the assassination itself. He was supposedly seen in Dealey Plaza, delivering a rifle, shortly before the assassination. Newcomers to the JFK assassination are aware that Oswald is supposed to have been the assassin, but are often unsure where he is supposed to have shot JFK from. Oswald’s whereabouts at the time of the assassination are uncertain, as is the notion that he fired any shots at all. A photograph taken during the assassination seemed to show Lee Harvey Oswald on the front steps of the Texas School Book Depository. The man in the photograph turned out to be a colleague of Oswald’s, Billy Lovelady. Who Saw Oswald in the Sixth–Floor Window? Howard Brennan’s description of a gunman in the sixth–floor window of the TSBD matched Oswald, but other witnesses gave descriptions that did not match the accused assassin. Neutron Activation Analysis was used on paraffin casts of Oswald’s hands and right cheek, and on fragments of bullets from JFK and Governor Connally. The House Select Committee on Assassinations claimed that NAA provided good evidence that only two bullets caused all the injuries; later research refuted this conclusion. Lee Harvey Oswald’s fingerprints and palmprints were found on two book cartons close to the sixth–floor window from which at least one shot was fired. His palmprint was found on the rifle. When Lee Oswald was last tested as a rifle shooter in the Marines, he was barely above the minimum qualifying level. There is no credible evidence that Oswald fired a rifle in the remaining four years before the assassination. Formerly secret documents such as memos and recordings of presidential phone calls show that the Warren Report cover–up was a practical solution to a political problem. It was claimed that Lee Harvey Oswald planned to shoot Richard Nixon a few months before the JFK assassination. The story was so implausible that even the Warren Report felt unable to use it. Some people are interested in whether Marina Oswald had bad teeth, a question that has no obvious relevance to the JFK assassination. How Accurate is Oliver Stone’s Film, JFK ? The release of the film JFK in 1991 set off an enormous amount of hostility in the press. This article examines how Oliver Stone’s JFK deals with the main issues of President Kennedy’s assassination. The media claimed that there were many factual errors in Oliver Stone’s JFK . Some of these claims were valid; others were unfounded. Some ‘errors’ were merely examples of dramatic licence. The Dallas police claimed to have discovered a home–made paper bag by the so–called sniper’s nest on the sixth floor of the Texas School Book Depository, although the authenticity of the bag is contested. The bag which Oswald carried on his journey to work supposedly contained curtain rods. Oswald himself claimed that he carried only his lunch; the Warren Report assumed that the bag contained a rifle. Despite getting almost all of their information about the assassination from the mass media, most people reject the official line. The term magic bullet theory is preferred to ‘single–bullet theory’ by those who want to emphasise the unlikely role of Commission Exhibit 399, which is supposed to have caused several broken bones while sustaining hardly any damage itself. According to the Warren Report , Jack Ruby had no connections to organised crime, and acted spontaneously in killing Lee Harvey Oswald. The House Select Committee on Assassinations claimed the opposite. Governor Connally’s right lapel flaps once in frame 224 of the Zapruder film. It was claimed to be the result of a bullet that had passed through President Kennedy, but was almost certainly caused by a gust of wind. The Warren Commission’s investigation is often accused of having been superficial and one–sided. Previously secret documents show that it was, and the reasons why. Three tramps were arrested in the rail yards just north of Dealey Plaza about two hours after the assassination. They were thought to have been part of a conspiracy to assassinate JFK, until their identities were revealed in 1992. They were just tramps. The main arguments against the idea of a conspiracy in the JFK assassination, together with counter–arguments. The main arguments in favour of a conspiracy, along with opposing arguments. Howard Donahue proposed in 1992 that George Hickey, a Secret Service agent in the car behind Kennedy, fired the fatal shot by accident. The theory was debunked, but reappeared, like a zombie, in a 2013 film, JFK: The Smoking Gun . There are many definitions of ‘conspiracy theory’ and ‘conspiracy theorist’. 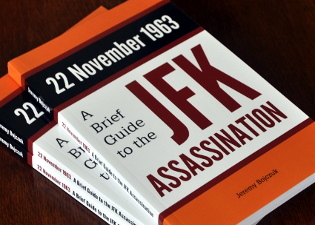 The JFK assassination provides illustrations of the literal and propaganda uses of the terms. Noam Chomsky’s opinion of the JFK assassination is not about whether or not it was a conspiracy, but simply that it isn’t a significant political event. George Joannides had two links to the JFK assassination: he supervised the Cuban exile organisation with which Lee Oswald came into contact in New Orleans, and he acted as a liaison between the CIA and the House Select Committee on Assassinations. Oswald repeatedly denied shooting JFK and Officer Tippit. Many of his other statements while in custody were less than honest. The newspaper and television coverage of the JFK assassination is consistently one–sided, for the same reason that coverage of other topics is one–sided. Was CE 399, the ‘Magic Bullet,’ Planted? Commission Exhibit 399, sometimes known as the magic bullet, was supposed to have injured Kennedy and Connally, but may not have been the bullet that was discovered on a stretcher at Parkland Hospital. Of course, Jack Ruby intervened before Lee Harvey Oswald stood trial, which allowed the Warren Commission and the media to pronounce Oswald guilty. What might have happened if Oswald had survived? There are many possible reasons why JFK was assassinated, depending on who was behind the killing: Oswald, the Cuban and Soviet regimes, anti–Castro Cubans, the mafia, and factions within the CIA and the US military. Is Robert Vinson’s ‘Oswald Double’ Story Credible? An Air Force sergeant, Robert Vinson, claimed to have seen a man resembling Lee Oswald escape by plane from Dallas after the assassination. One of the more unlikely theories claims that Oswald was in fact two people, ‘Harvey’ and ‘Lee’, one of whom was a Hungarian who spoke Russian. The only suspect in the assassination was interviewed officially for about 12 hours, but no recordings or transcripts appear to have been made. Lee Harvey Oswald’s alibi, as far as we can tell, is that he was on the first floor of the TSBD. Two news films show a figure, known as ‘Prayer Man’, standing in the corner of the TSBD steps. The figure has not been identified for certain, but it may be Oswald. It has often been claimed that dozens of witnesses stated that President Kennedy’s car stopped on Elm Street during the shooting. In fact, a large majority of witnesses stated merely that the car slowed down.